eBay made itself a destination site by being the place where people can find just about anything. Over the years everything from Britney Spears' bubble gum to potato chips loosely resembling religious figures have been offered for sale on the site. 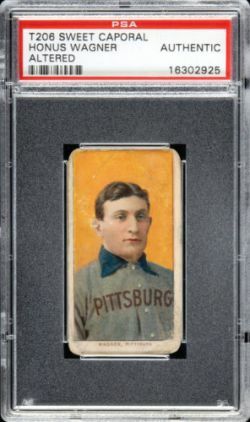 It may not be the first, but a T206 Honus Wagner has been listed on the auction site. The card has been authenticated by PSA and labeled as "altered." It's being offered alongside a similarly authenticated Eddie Plank. The asking price for the pair? Precisely $359,999. The seller, who currently has a feedback rating of 187, mentions in the description that they're willing to consider serious offers. The seller's description is honest, noting the background of the card. It's up front about how the card's previous owner didn't mean to harm the cards when they had them touched up. They simply wanted them to display better. The auction runs through October 7th.